I woke up this morning and saw this image on my pinterest feed. It inspired me…so with this feeling and thought of kindness I am writing to share what I am seeing and learning in my life, in the hope that my stories will help you to see things differently, dream differently and live differently. In November 2014 I was laid up with a prolapsed disc, it’s a very long story that I won’t bore you with, what I will say is that it was immensley painful and a very, very big sign to stop all the things I was doing and being. For those of you who have ever been immobilised you’ll know how it feels to be housebound, bored, in pain and constantly in your head…this is the space I was living in for four long months. I look back on that time now and realise it was a big game changer for me. It made me stop…literally and look at all aspects of my life. What I did for work, how I looked after my health, how my thoughts drove my behaviour, who were the people who really cared about me and my dreams for my future. My medical friends would be interested in which tablets I was taking. My family would rally around and make sure I had food, supplies and regular visits and phone calls. So through this haze of pain and pill popping (which by the way I hate taking due to the endless lists of side effects or as a friend said they are actually direct effects, they are known to happen) I began a process of reflection. I remember my coach asking me during one of my hazy coaching sessions ‘are you being kind to yourself?’ this got me thinking what is kindness? it’s not a word I normally use and not a word I’ve heard people use to describe me. 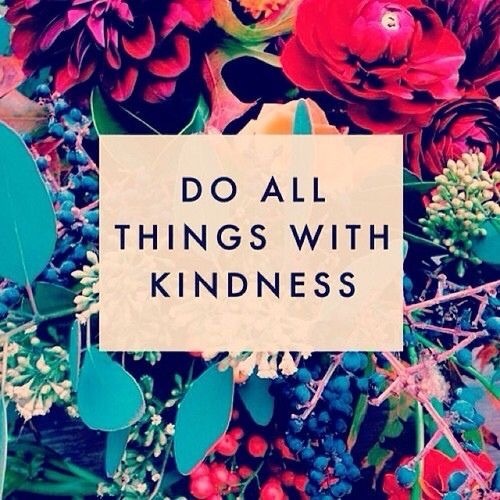 So what is kindness? in my mind it was like the word nice, a non-descript word, a polite word you use when you have nothing else to say. My curiosity was piqued and I googled the definition. Now these are words I recognise. The big question was am I being those things to myself? Am I considerate to myself? umh errr no I don’t believe I am. The cogs started turning and I began to search through the huge archive of memories stored in my brain. Was I considerate to others? that’s easy… yes I am, the stumbling block came when I asked am I considerate to myself? So in turn am I kind to myself? Now that this light bulb moment and awareness was firmly planted in my mind I began to notice signs everywhere, in conversations, in my thoughts, in my beliefs, in my actions and like a big shining light in my social media feeds just incase I forgot. I can’t escape it and neither do I want to. My journey of awareness about kindness continues and for the past week I have been listening to podcasts via www.thelifecoachschool.com and Brooke Castillo, the founder talks a lot about kindness. “Be kind to yourself, don’t beat yourself up, don’t be hard on yourself, don’t criticise yourself, be kind and by being kind to yourself first you can change anything you want in your life”. I now know that kindness is important in life but even more important is my kindness towards myself. I am changing just by being aware and I realise that awareness is the first step towards action, after all if I’m not aware of ‘it’ how can I change ‘it’. My journey continues and I ask…are you being kind to yourself today? I dedicate this story to my friend Carol, who I am sharing my journey of discovery with. She is the kindest and most considerate person I know, she is the sunshine bringer, the coffee drinker, the dream liver, the opposite to me in many ways and yet at the core we are the same.